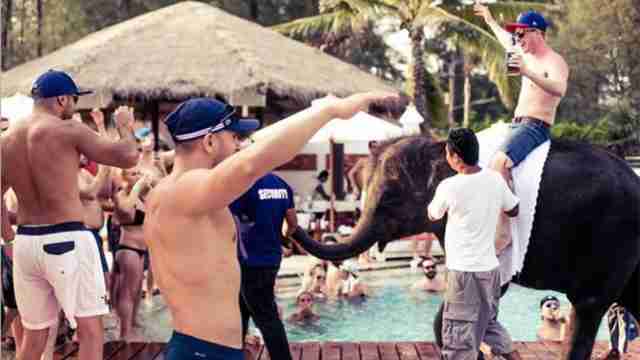 A popular Thai beach club has promised to stop renting elephants for parties after receiving backlash over photos of baby elephants surrounded by drunken revelers. 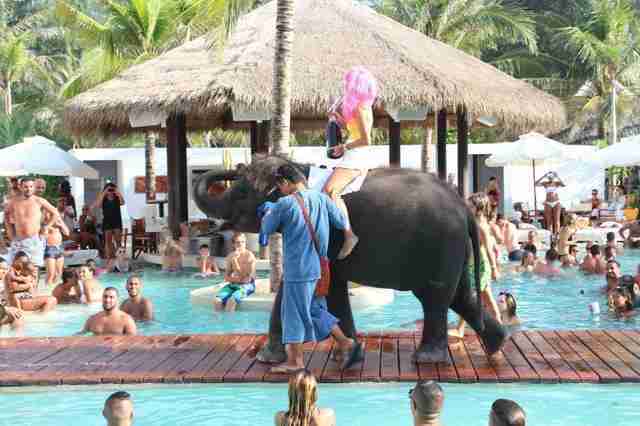 Photos taken at Nikki Beach Phuket show a young elephant being ridden by a shirtless guy holding a beer at one event, and standing on a small bridge over the pool at another party, penned in by bikini-clad women. 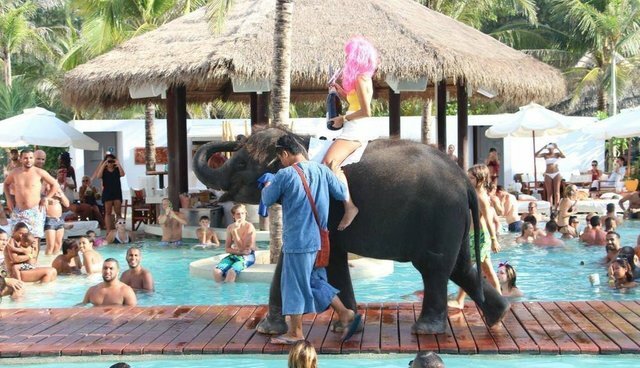 Earlier this month, a photo that appears to have been deleted showed a woman in a bright pink wig riding the elephant through a pool party while holding a huge bottle of wine. An elephant also made an appearance at several galas, including the resort's opening night party in 2014 and last New Year's Eve. Last year, he attended a birthday party for "Twilight" star Kellan Lutz, where he was ridden by a woman in a white bikini and angel wings. The resort has been posting elephant photos for more than a year but the images have only recently spread and garnered considerable backlash. 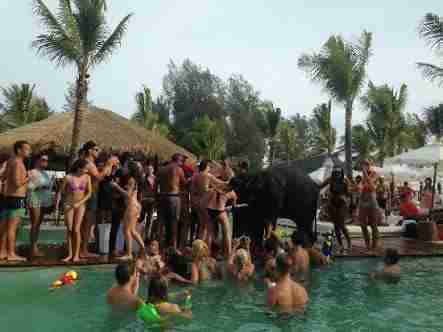 Many people commented on the resort's Facebook page, condemning them for exploiting the elephants, while others started a Facebook group titled "Boycott Nikki Beach Hotel 'Puket.'" The club was also criticized by wildlife rescue Wildlife Friends Foundation Thailand. 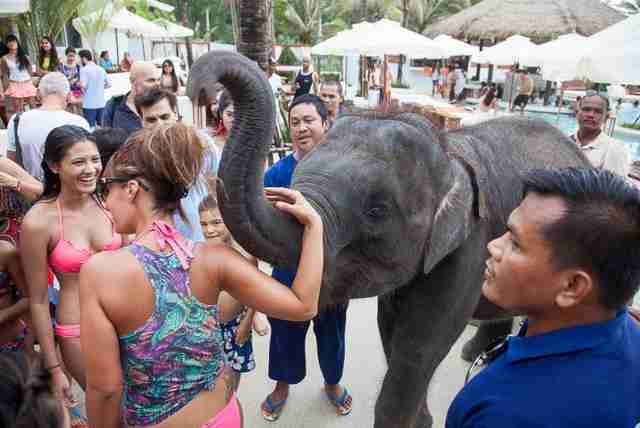 In a statement posted Friday on its Facebook page, the resort clarified that it had never owned an elephant but rented him from a "reputable" local caretaker. 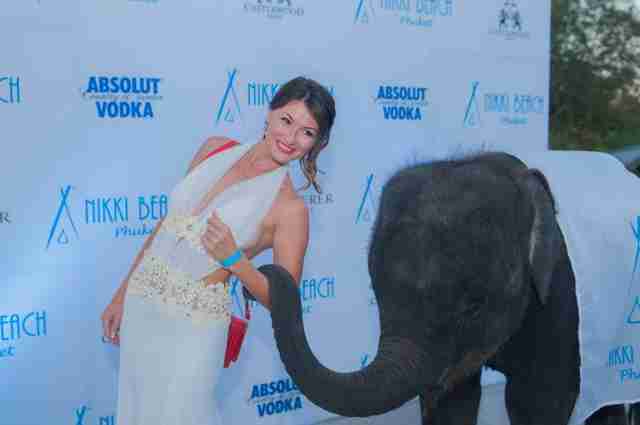 "We understand that this has upset many of our customers and animal advocates around the world, so effective immediately, we will stop granting the requests for elephants at Nikki Beach Phuket," the group wrote. "The Nikki Beach family will never stand for the mistreatment of animals." The exotic animal trade runs rampant in Thailand. Babies born into captivity are torn away from their mothers well before they should be, while wild mothers are often killed so their babies can be taken and sold as exotic pets or for use in the animal tourism industry. Many of these animals are chained in tiny cages and beaten and abused until they obey - a practice known as "breaking" - and some are even drugged so they're more receptive to tourists. Each year, tens of thousands of animals fall victim to the lucrative, often criminal global industry. Fortunately, decisions like the one made by Nikki Beach can help stem the tide of the wildlife trade.